A few months ago we brought you news that Instagram/DCJY Facebook group member @guacasaurus_mex (or Tom Napiorkowski, as his human friends call him) had successfully ported Flappy Bird to the humble Dreamcast VMU. Looks like Tom's been busy since then and has just released his next game to make use of the removable storage nugget: Street Race. 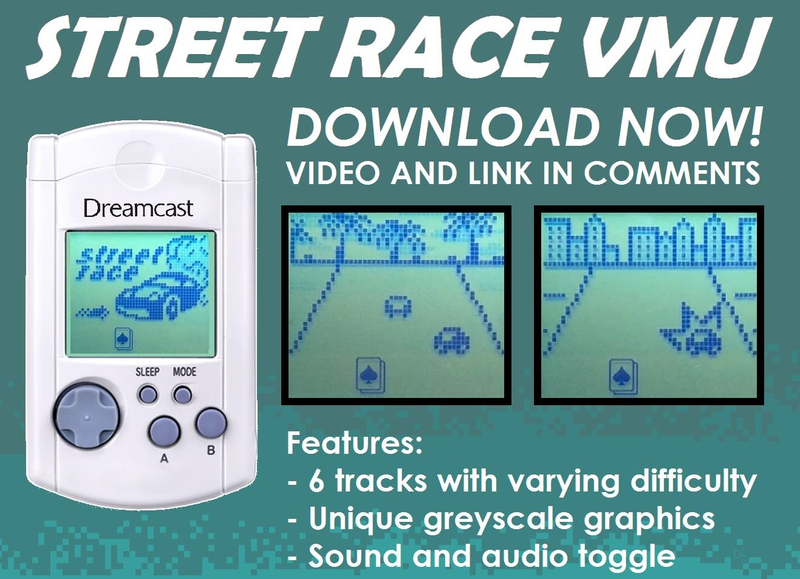 This is quite an ambitious title for the tiny dot matrix and humble Sanyo LC8670 CPU beating at the heart of the VMU, but somehow Tom has managed to cram 6 different tracks, grey scale graphics and rudimentary audio effects into Street Race. There's a gameplay video below and you can download the CD image file here or the SD reader file here. Both work in a similar fashion to the Flappy Bird files in that you need to use the bundled VMU Tool software to add the Street Race file to your VMU. This is impressive stuff from Tom/Guac, and we can't wait to see what else he creates for the Dreamcast's unsung hero. It should also be noted that the download files for Street Race contain the original Flappy Bird game too, so there are now two reasons to get those VMU battery supplies stocked up! or SF Bonus games like Barrel game, Car wrecking, Drums and Brick?